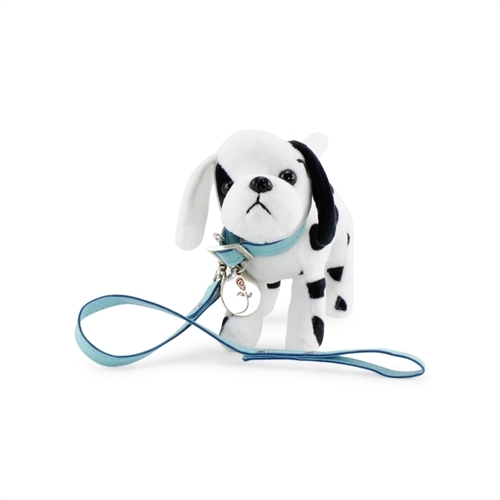 Every 18-inch doll needs a playful companion, and there's none better than this adorable 101 Dalmatian-inspired "Patch" puppy. There is nothing cuter than this black and white spotted pup! 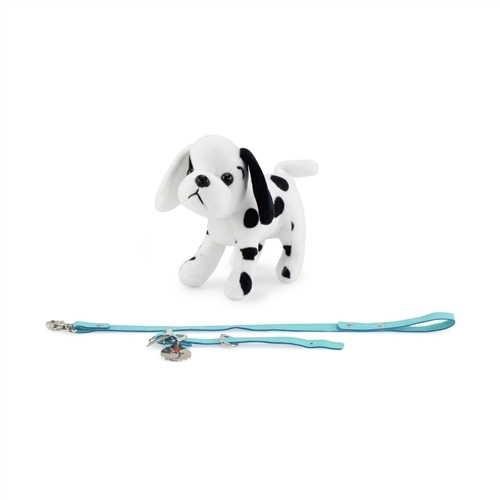 Your American Girl doll's new puppy comes ready for a walk in the bark park with a lovely teal colored faux-leather leash, removable collar and one-of-a-kind metal dog tag with the Emily Rose flower logo! Start your endless romping and frolicking through the park today! Super Cute 18" doll Dalmatian puppy dog stuffed toy has the most adorable face and is the perfect size for 18-inch doll! This amazing puppy comes with a teal faux leather detachable leash, matching removable collar, and awesome metal dog tag with Emily Rose flower logo. Doll accessory made to fit 18-inch dolls such as American Girl ®, Madame Alexander, Gotz, Journey Girls, My Generation, etc. Doll, pet carrying case and dog toys not included. Search on product code INS3076 for the pet carrier and dog toys.